The years 1975 and 1976 brought a flood of great toys and other merchandise from the Gerry and Sylvia Anderson spectacular, Space: 1999. I've written about the giant Eagle One space ship before, as well as the Moonbase Alpha HQ. Today, I look back at the action figures who populated Main Mission. Three nine-inch figures were produced by Mattell, all bearing the likenesses of the actors on TV. These "exciting TV characters from Moonbase Alpha" include Commander John Koenig (Martin Landau), Doctor Helena Russell (Barbara Bain), and Professor Victor Bergman (Barry Morse). In terms of the face molds, all three characters boast a strong resemblance to the real life models. The back of the card describes the characters and their milieu: "Action figures stand nine inches tall. They can sit, stand, and they're poseable. 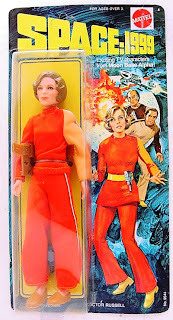 They wear Space:1999 uniform with Stun Gun and holster, plus Communicator-Computer which clips to the belt." The idea was clearly to "collect 'em all" (and compete with Mego's popular Star Trek action figure line). Perhaps the coolest aspect of these action figures is indeed their series-related, space-age accouterments. The stun gun and comm-lock are very authentic-looking, and molded in machine gray. Although the figures' hands can't hold the stun gun, there is a clip on the comm-lock which at least allows for the appearance that they are in use. 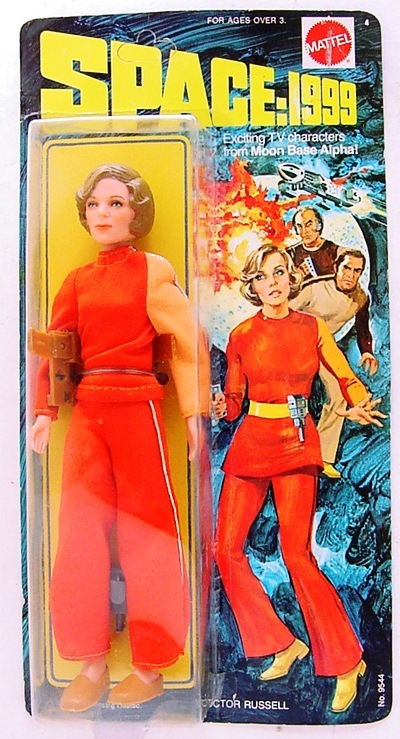 The biggest disappointment with Mattel's Space:1999 line is the general inaccuracy of the uniforms. Professor Bergman wears a dark brown uniform, and Dr. Russell's is shades of bright orange. On the TV series, all the characters wear a cream-colored basic (unisex) uniform, with only one sleeve in color (marking what division of base operations they work in.) Koenig should have a black sleeve, for instance, but instead he has a cream uniform and a brown sleeve. Bergman, as an unofficial adviser, should have no color mark on his sleeve. The figure has a cream sleeve. As boys in '75, my friends and I loved these action figures. However, like you John, it disappointed us very much that they made the toys inaccurate with incorrect uniforms. They went through all the trouble of making the faces perfect and then the uniforms are totally wrong!